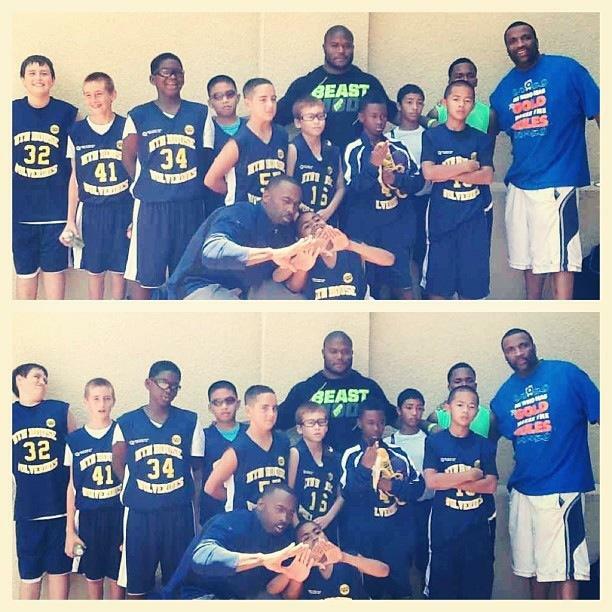 (USA-California-Santa Clara June 30, 2013) —- The Mountain House Wolverines 5th Boys, coached by Tavio Meeks, took 1st place at the Road Dawgs AAU Tournament in Santa Clara, California and had the thrill of meeting NFL Player Michael Robinson all in the same ady. They completed an impressive 3-0 sweep by defeating each team by 20+ points! The coaching staff considered this a warm-up tournament for the West Coast Championships between July 5-8 in Anaheim, California where this squad will be representing the city of Mountain House, playing tough competition from Southern California! This team is a combination of players from the Wolverines Spring teams. Coach Tavio and Ed are working the boys to be ready for national competition! Pictured with the boys is one of the Wolverines sponsors, Michael Robinson of the NFL’s Seattle Seahawks. The Wolverines proudly wear the logo of his foundation Excel to Excellence! Thank you Michael for supporting our Wolverines kids!